This week Soundtrax features an exclusive interview with Italian composer Maurizio Abeni, whose scores for Sergio Stivaletti’s Wax Mask and The Three Faces of Terror mix 50’s horror scoring styles with 70’s giallo as well as modern horror music sensibilities. Abeni discusses these scores, and others, in detail. We then step into super hero territory by reviewing Trevor Rabin’s soundtrack music from Get Smart (“an appealing mix of modern Zimmeresque action movie propulsion and retro 60’s action material “), examine Craig Armstrong’s The Incredible Hulk (“definitely one of the best scores of the year thus far”), Danny Elfman’s latest, Wanted (“dark, rhythmic, percussive and bass-driven score”), and Thomas Newman’s robotic riffing for Disney’s latest Pixar release, Wall-E (Newman “transforms his trademark style into a mixture of quirky orchestration and full-on orchestra bombast suitable for the science fiction environment”). Other reviews this week include Mark Kilian’s exotically flavored score for Santosh Sivan’s Before the Rains (“fine score with a persuasive and compelling sound texture”), Ennio Morricone’s romantic score for A Fine Pair, thought lost forever (“a rare Morricone score thought lost forever”), and Silva Screen’s latest compilation, Music from the Films of Tim Burton (“a quite nice and fairly faithful adaptation of the music from a dozen of the director’s films”). Q: How did you first become involved in motion picture music? What led you to this form of composition and how did you break in? Maurizio Abeni: I like consider myself a musician who offers his talent to different forms and expression of music. I really don’t know what kind of musical animal I am, although I certainly am musical. From the beginning I’ve been a pianist and I still am in the very depths of my soul, but over the years I’ve become an arranger, composer, and conductor. As a child I was always captured by all kinds of movies but I didn’t imagine of making film music; I was more interested in playing classical and jazz music. The events that enlightened me about film music were not clearly realized but instead worked under the surface and emerged later in my awareness. I’ve analyzed this process only after I was already working on film music. These event were the coming in charge of Alessandro Cicognini (composer of De Sica movies and more ) as Music director of my Conservatory in Brescia and his advice for me to begin studying composition and his invitation to send me to conduct a concert in Rome (I was only 14) where he invited Nino Rota to listen me. At that time I didn’t know even who he was but later that little man who shook my hands came often in my mind and left a seed in my will to work for movies. So after finishing my studies in Italy and afterwards in Sweden, I decided to move to Rome and try to work in movies and television. And in Rome it happened that, along with my life companion Anna Karin Klockar, who is a refined composer of herself, we went to CAM (the music publisher of most of Italian historical movies) and by chance got to score the music for an American movie called Lightning The White Stallion  with Mickey Rooney. The true reason why we got the job was that the money was ridiculous and that there were only ten days to do all work! So we did our best with the ingenuity and the irresponsibility of being 25 years old! Q: How would you describe your approach to The White Stallion and some of the other early efforts in your filmography? What challenges did they pose for you? Maurizio Abeni: The first movies I scored were pretty obscure productions with very low budgets. At the same time, I also worked as pianist, keyboard programmer (later computer programmer), arranger and conductor for a lot of TV shows. I also worked in film music by assisting composers older and more famous than me. With them, I often had to make just a few instruments sound like a whole symphony orchestra. That gave me an opportunity to analyze the filmic material from inside, giving me an experience that composers can seldom get. So I learned how to use a big orchestra and work at light speed. I’ve almost never been involved in a project in which everything didn’t have to be done by yesterday. But I must say that I never considered my contribution as work, I prefer to think about it as a privilege because I do what I need to do for keep myself alive: music. Q: How did you become involved in Maschera Di Cera (Wax Mask )? Maurizio Abeni: For Wax Mask I got in touch with Sergio Stivaletti through a common friend. I made a demo (which later became the Main Title) for him and he it liked very much, but the producer first tried to hire a more “famous” composer than me, because they wanted a name in the credits, you know how it works! Fortunately for me, the “famous” composers they approached didn’t work out – some were busy, some thought there was lack of time for to compose a wall-to-wall score (they had 1 month) and all of them probably thought there was too little money – but that is just my own presumption. So I went for it, and I was excited to be able to use a big orchestra. Q: Your elegant score for Wax Mask, in the great tradition of the giallo scores of the 1970s, played against the horror of the story by composing music of sublime beauty. How did this approach come about – were you influenced by previous giallo scores? Maurizio Abeni: This movie and the score I provided are in the tradition of horror movies of the 50s especially the British Hammer Film, so the musical influences are surely coming from that, without forgetting my classical background. I remember that in those days I was listening to Franz Liszt’s “Dante Symphony,” and I’m sure to have been inspired by that. Q: How closely did you work with director Sergio Stivaletti (who I understand stepped in to direct after the death of Luci Fulci) in establishing the musical tone for the film? Did you work at all with Mr. Fulci or Dario Argento on the film before Mr. Stivaletti stepped in to direct? Maurizio Abeni: I worked almost alone because I stepped into the project when the movie was in post production. I met Sergio only a couple of times because he was completely absorbed by finishing his first movie, adding all the effects he wanted against the production rush to finish the movie. Besides the film problems I became father of my daughter Greta during the scoring and Sergio would become father of his boy Michelangelo after few months. I met Dario Argento once before the mix, and then saw him only during the mix. He had always very nice words for me and my music. Q: You used choir and organ along with orchestra to wonderful effect in this score. How did you come up with the score’s orchestral texture and tone – and what elements of the film were you trying to mostly evoke through your musical approach? Maurizio Abeni: Well, it’s a cliché, of course. If you think about the protagonist, he is like a sort of Phantom of the Opera or a Captain Nemo. Even if he doesn’t play the organ in the movie like they did, I felt that the sound was in the air to get the atmosphere of a man who thinks himself to be all-powerful. Q: Do contemporary horror films like Wax Mask need scary music, or do they need music that soothes an audience so that the scares become more potent when they occur? What is Maurizio Abeni’s style of composing for a horror film such as this? Maurizio Abeni: Not all horror movies look the same, and neither does the music. Wax Mask was a sort of style exercise with a declared devotion to the movies of 50’s that I had to indulge in, but on other occasions I’ve enjoyed not having to cover the pictures with millions of notes and instead provide the minimum sounds necessary until the music is called to its duty to punch the audience in the ears and in the stomach. The problem is that often the weakness of a movie can’t bear the absence of music and even if it does, the producer or the director are nervous of an audience’s reaction, so they prefer always to follow a well known path. Q: How does a more “normal” type of murder mystery, like La Quindicesima Epistola , differ from a pure horror film like Wax Mask? How would you describe your score for this film and its thematic nuances? Maurizio Abeni: First of all, this is a TV movie so the horror has to be smoothed for a less specialized audience. This movie had also nuances reminiscent of Italian comedies of the 60’s, so I had some thematic material that counterbalanced the “noir” clerical musical score. By the way I’ve just scored another TV movie which has almost the same atmosphere with a clerical “noir” main musical score and romantic love music, called Io Ti Assolvo. Q: Quindicesima Epistola was also affected by its clerical setting, which prompted choir and church-type music as a setting/counterpoint for a wonderfully melodic musical theme and some very compelling solo human voicings. How did these elements affect your scoring of the film and its central core – the murder mystery? Maurizio Abeni: I always let things happen by chance. At that time, the girl who took care of my daughter sang jazz, her name was Magdalena Konefal. I discovered that I could work on her voice to make her sound like a Byzantine nun singing in ancient Greek. So I convinced her to do it, and I think we succeeded. That sound can be connected in the film with the fanaticism and madness of the murderer who is the Mother Superior. Q: What was your thematic interplay on this score? Maurizio Abeni: The thematic interplay is made by the theme of Quintalina who is the servant of the Father Superior, a simple girl coming from the countryside. 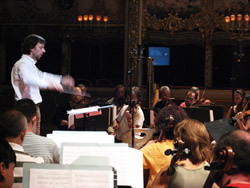 The theme is inspired by the music of Alessandro Cicognini for Pane Amore e Fantasia . 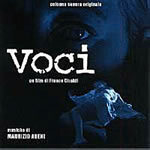 Q: Voci  was another excellent score for a contemporary crime thriller. This one seemed a little more percussive than some of your other scores. How would you describe your initial approach to scoring this film when you first became involved, and how the score evolved through the scoring and recording process? Maurizio Abeni: Voci came after four TV movies I did with Franco Giraldi: Morte a passo di danza, Il mistero dell’uomo scomparso for the series Avvocato Porta , and Il centravanti è stato assassinato verso sera and Alla ricerca di Sherazade for the series Pepe Carvalho . In this case the lack of budget was a good but that wasn’t the only reason I composed a minimal score – I was hired at the last minute in spite of the will of Franco Giraldi who wanted me from the beginning – but the producer tried to hire some friend of his who couldn’t clear the job at the end. But I think it’s minimal only in the number of instruments, on the other side it is rich with uncomfortable atmosphere and musical suspensions and songs, one of which is the key of the movie. 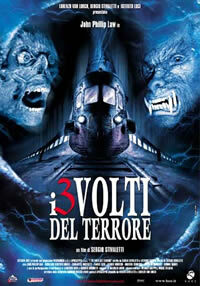 Q: You rejoined Sergio Stivaletti for the anthology horror film, Il Tre Volti Del Terrore [The Three Faces of Terror, 2004], a score which is also bookended by a luxuriant theme for female voice and strings – tied in with the hypnotic orb that generates the film’s trilogy of stories. Would you describe how this theme came about, and how each of the individual stories had their own kind of mini-score, enveloped, as it were, by the lilting, primary “hypnotic” theme that sounds in the film’s opening and closing? Maurizio Abeni: This horror is dedicated to the giallo movies of the 70’s so the music is in that line. Also in this film Sergio Stivaletti shot the main title scene having his 8-year-old son Michelangelo as a character, drawing and floating in the space, so I decided that also my daughter Greta, who is a close friend of Michelangelo, should be in some way in the picture. So she is the childish voice who sings in the main title. This theme comes several times, but each story has its own musical material. The music of the “Un Viso Perfetto” sequence with the mad plastic surgeon is an homage to the music of the great Piero Piccioni, who did a lot of this kind of lounge music. Q: What were the challenges of scoring Il Tre Volti Del Terrore? You seemed to rely on synthesizer quite a bit on this score, and yet each of the three stories has a musical flavor of its own. Maurizio Abeni: As usual the lack of budget for a small movie like this forced me to find a way to work only with synthesizer, as I usually do I try to see the limitation as a stimulating aid to do my best. As in musical forms like a fugue you are limited by a lot of rules, you learn how to move yourself comfortably and be creative in spite all. Q: There are also moments in the score where the music assumes a strong rock-based flavor (werewolf attacks, the lovers attacked by the lake guardian, and the conclusion where the hypnotist reveals the ending of the stories to the group on the train). Please describe your use of rock-based music, as distinct from the synth and the orchestra/voice music used in this score, and what effect you wanted to derive from it. Maurizio Abeni: In this case I used it for two reasons: one because it gave a less serious approach to the scene that had to be viewed with a bit of irony, and the second reason is that the man who is killed by the werewolf in the swimming pool (that’s my house – talking about small budget films…!) is Claudio Simonetti (of the band Goblin), so I had to make a tribute to Deep Red, which is almost cited. Q: In the romantic drama Vaniglia E Cioccolato  – where there are no masked killers, werewolves, or lake monsters – what elements of the film became central to your score? Did you find this type of score a nice change of pace? Maurizio Abeni: The love theme! I think I risked getting diabetic with this movie. I had to face with director Ciro Ippolito who wanted a music that was more than romantic – he tried to sing in my ears themes like “Love Story” “Love is a Wonderful Thing” “A Man and a Woman” “Sandal in the Sun,” etc! Can you imagine? I don’t know if I ended standing on my feet or on my knees but I came to the end – on the other hand I had to counterpoint this romantic lush music with some Mediterranean music, since the main male actor was the Spanish dancer Joachim Cortes, so I had fun making some flamenco and other Spanish-flavored music with guitars and mandolins. 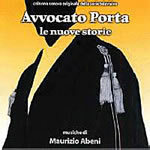 Q: The comedy/thriller TV series L’avvocato Porta  called for music that supported both the film’s action and mystery while anticipating its comedy. You’re not writing “funny music” (any more than you’re writing “horror music” in a scary movie) but you’re setting up the film’s humor by providing straightforward music, just the way you set up a the scares on Wax Mask). Is the approach to scoring horror and comedy similar? What, then, are the differences? Maurizio Abeni: No it is completely different. I think it is generally more difficult to make people laugh or smile than make them cry or scared, and it is even more difficult to be musically ironic and subtle without being commonplace. I think I am very inclined to comedy but I never had the chance to score a real comedy. In Avvocato Porta, the comedy was just a second side of the movie which was actually a thriller. Even the comedy part had to be bittersweet because the unlucky star upon the unfortunate lawyer, played by Gigi Proietti. Q: Italian cinema has had a long legacy of film music, one which you seem to have tapped into with your scores for giallo/horror films and police thrillers (you haven’t yet scored a Western, however! – that other grand musical legacy of Italian moviemaking). What do you feel are your influences as a film composer – and what kind of an influence would you like to leave on the composers who will follow you? Maurizio Abeni: My influences come primarily from my classical studies, but I feel influenced by everything touches my sensitivity. Then I must say that one can be touched by the music of a great composer but it would not be smart to try and be like him, because everybody has his own nature and it is very wrong to go against it. You have only to let yourself get contaminated because music is a sweet sickness from which you can be cured only with other music. In movies I like to think myself closer to those musicians who, like me, are pianists from the beginning. I hope they will not shame me for it, but I feel my musical sensitivity is closer to musicians like Dave Grusin or Luis Bacalov. On the other hand, I’m very indebted to the Italian musicians like Cicognini, Lavagnino, Trovaioli, Piccioni, and Morricone because through their music they gave me an explanation about when I come from and why I am like I am, and not only as musician. I hope to have time and opportunities to make better music and to leave a more personal track in the film music world. In any case, I consider myself, starting from the inheritance I’ve received from those great Italian composers, a bridge for the younger composers to come. 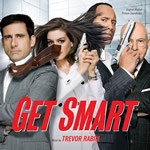 On Tuesday Varese Sarabande released Trevor Rabin’s soundtrack to the new Get Smart movie, which I’m really looking forward to seeing when it opens on Friday. I think Steve Carrell will make a perfect Maxwell Smart. I’ve been watching the Time Life Complete Series DVD set and I’m amazed at how fresh and funny the old show remains – thanks no doubt to creators Mel Brooks and Buck Henry. We’ll see how the new movie does. But musically, at least, Rabin proves a fine choice to score the film – his music is an appealing mix of modern Zimmeresque action movie propulsion and retro 60’s action material – lots of hybrid epic action drive and lots of 60’s electric guitar wafting around it all. Rabin makes a lot of use of Irving Szathmary’s 1965 TV theme, giving it a modern edge and dynamic (Szathmary, by the way, was comedian Bill Dana’s brother; this was one of three TV show’s he’s credited with scoring, and that’s it). That TV theme is the anchor upon which Rabin hangs the rest of his score. Opening with “Smart Dreams,” is the usual kind of rhythmic fusion of synth and symphs that Media Ventures acolytes continue to pave their scores with – and I say that without real denigration as I tend to like that approach to deriving epic-styled dramatic hero-action music even though it’s become a little too pervasive in contemporary film scoring. But once Rabin lets his angelic strings and French horns part the way and he launches into a furious, rock-driven variation of the Get Smart TV theme we know we’re in for a good sounding time. There are four ensuing and distinct variations of the get Smart theme, labeled “Look one”, “Look two,” and so forth; each of them takes the Szathmary theme into different musical directions and each is a refreshing bit of retrograde refurnishing in which the TV theme sits well in a new environment of, say, funky R&B grooving or Latin percussion riffing, or a bluesy Schifrinesque urban groove. The theme also appears from time to time in other cues, just to remind us what we’re watching. “Cake Factory” proffers a compelling riff supporting a suspense/action sequence, with reverb’d vibraphone and mandolin grooves, harsh guitar chords opening into a lavish if brief orchestral melody, funky guitar strumming doubled by strings; it’s an evocative interpretation of 60’s suspense scoring redrawn through the musical lens of 2008. “Max Ejects” takes on a similar sensibility with recurring reprises of the Szathmary motif popping up, like the teasing rodents in a KAOS-controlled “Whack-A-Mole” game. “Max Denied” proffers a reflective and sympathetic attitude from French horns and trumpet over a warm bed of strings and winds; a straightforward poignant moment on behalf of the bumbling superspy, which culminates in the confident rhythm of the opening theme. “Agent 23” provides a meaty urban groove for Dwayne Johnson’s character, with whom Max had hoped to partner. “Entering Moscow” returns us to Rabin’s trademark action riffing, providing a compelling orchestral rhythm embellished by quirky guitar strums; the motif recurs softly in “Max Calls 99,” where the introductory theme becomes a kind of poignant love theme for Max and Agent 99. The same motif is reprised tenderly for piano and strings in “Wish We Had More Time,” before opening up for a swelling from the orchestra. “Smart Exit” is a final affectionate, powerhouse take on the TV theme. Max Smart’s relentless march down the corridor of multiple doors has never sounded so dynamic. 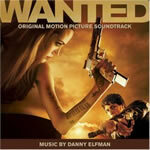 Lakeshore will release Danny Elfman’s score for the forthcoming super-hero film, Wanted, on June 24th. It’s one of two new Elfman scores coming out this summer (the other is Hellboy II: The Golden Army). Wanted is also one of two oblique takes on the super hero mythology hitting theatres this summer as well (the other is the Will Smith starrer, Hancock). Wanted opens with a cool rock song, written and performed by Elfman, that pretty much sets the tone for this score. Even though it’s primarily orchestral, Wanted is overall primarily a dark, rhythmic, percussive and bass-driven score with few of the nuances we have come to especially enjoy from Elfman. It’s a good score with some potent violin section riffing (Elfman’s pallet is heavy with strings; there is minimal percussion and a moderately-sized horn and wind section, according to the players list included in the CD booklet), but it’s essentially little more than a dark rhythm piece. Derived from Mark Millar’s graphic novel series and directed by Russian helmsman Timur Bekmanbetov (creator of the amazing Night Watch series), the movie has to do with a hen-pecked misfit called Wes who is recruited by Angelina Jolie to join The Fraternity, a secret society that trains, essentially, common people to become super heroes. Elfman characterizes The Fraternity with a deep, undulating male chorale motif, over the same sharp strokes of strings that were introduced in the “Success Montage” that opened the score. It’s a pretty cool rhythm track. “Wesley’s Office Life” is delineated by a modernistic rock riff for electric bass, tapping percussion, slap-strummed electric guitar, shredded orchestral chords and again those staccato string slices that give the score much of its very potent forward motion. The heavy, rhythmic rock beat that is prevalent in much of the score pervades most of “Exterminator Beat,” which seethes with a dirty, urban darkness and a vicious vibe. “Revenge” is a dish Elfman serves upon a bed of heavy metal shredding from electric guitars, percussive synth, and progressive strings that drive it all relentlessly onward. Much of the score is a little too caught up in electric rhythms to provide a lot of musical diversity, although I can imagine it works well in the film to build the necessary onslaught of excitement. Still, the score on CD does have its moments, and these are usually associated with Jolie’s character, where Elfman allows the score to soften and reflect the more vulnerable interior of the cold and confident hero trainer. “Fox’s Story” is lined with tenderness, soft vocalizations over strings, with embellishment from what sounds like zither, as the character’s backstory is revealed. “Fox’s Decision” is eloquently revealed with a backing of (sampled?) vocalisms (almost taking on the sound and texture of ethnic woodwinds) and brashly-beaten percussion, assuming a climactic profundity through full choir and strings. “Fate” gathers much of her musical sensibility and resonates over it with strings and choir, affected by counterpoint from low horns, before segueing into the stabbing violin riffing that takes us to the end of the cue. Aside from this character motif, the rest of the score, as represented on CD anyway, is mostly all of the same matter. Thomas Newman’s second animated feature score for Disney, rejoining his director from Finding Nemo, has been released on CD by Disney. WALL-E, a love story between earth’s final robot, which humanity forgot to turn off when the fled the planet for safer shores, and the sleek search robot (named EVE, get it?) (also: all the robot names are acronyms, you see) sent back to find out if Earth is rehabitable or not. This is also Newman’s first science fiction score, although the music’s emphasis is far from science fictionesque. 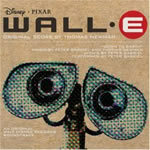 With WALL-E, Newman engaged in his classic musical trademark of deceptively simple patterns built on repeating progressions, transforming that style into a mixture of quirky orchestration and full-on orchestra bombast suitable for the science fiction environment. His main theme embodies an idiosyncratic piping woodwind motif punctuated by whistling chorus, harp, pizzicato strings, and weird percussion sonics that enhances the anthropomorphism of the WALL-E character with musical relish. The ensuing score abounds with the kind of quick-notation and rapidly plucked string or harp or piano notes that Newman has made his trademark, modified into the new setting in which WALL-E finds itself. 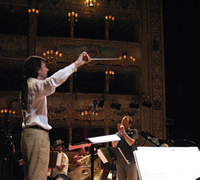 Motifs grow from the staccato rhythm of plucked harp and beaten drum into an array of propulsive rhythmic textures, adding choir and pounding timpani (“March of the Gels”), or from cyclonic string patterns over piping winds into a riffing of quickly plucked harp over lightly strummed acoustic guitar, laying down a pleasing pattern of musical activity and emotional urgency (“Desperate EVE”). Elsewhere, Newman embraces the bombastic orchestrations of Star Wars as it defined futuristic space opera music. Brasses intone and woodwinds chirp and drums bellow, a definite Williamsesque swashbuckler can be detected in several cues, yet shone through Newman’s own stylistic vocabulary. “Mutiny!” is a grand orchestral action cue, opening with horns and harp piping in Newmanesque fashion, overtaken by hushed intonations of choir, and then moving straight ahead with a frantic bit of energetic activity from brass and strings. “Repair Ward” proffers a cool rendition of a bluesy rhythm number, with massed high woodwinds intoning the melody over an evocative base of keyboard, bass, and echoing percussion, all reverberating in crystal clarity. “M-O” provides a similar sensibility with a sultry piping of light winds over an undercurrent of metallic gears and chains. Newman engages in a lush lounge tune called “First Date,” giving the appropriately saccharine expression to the robot’s initial attempt at wooing EVE through a lively choir, flutes, and keyboards. Bert Kaemfert, move over. Peter Gabriel co-wrote with Newman and performs the song, “Down To You,” and he also co-composed two score cues with Newman. The album also includes a pair of songs from the musical Hello Dolly performed by Michael Crawford (that musical reportedly inspired writer/director Andrew Stanton to create WALL-E) and a Louis Armstrong’s standard “La Vie En Rose,” sequenced in amongst the score tracks. 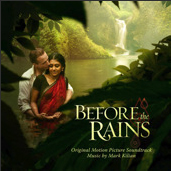 Mark Kilian (co-composer, with Paul Hepker, of Tsotsi and Rendition) has composed the provocative score for Before The Rains, which will be released by Lakeshore on July 22nd (it’s already available on iTunes for digital download). Set in 1930s southern India against the backdrop of a growing nationalist movement, the film is the English language debut of acclaimed Indian director Santosh Sivan’s (known for Asoka and The Terrorist). The film tells of an idealistic young Indian man who finds himself torn between his ambitions for his future and his loyalty to the past when his neighbors learn of an affair between his British boss and a local village woman. The sumptuous score is appropriately exotic, brimming with Indian ethnicity and airy, spiritualistic atmospheres. Tablas and sitars, shakers and gongs, evocative voicings lay down an attractive and lingering atmosphere, with trumpets and synths giving the music a contemporary flavor. This fusion of old and new, Western and Eastern, lends itself to the story’s similar contradictions and complications. A recurring motif is a haunting moan, initially sung by the female vocalism in “Main Titles,” “Before the Rains,” and “Down The River,” and later taken by a sarangi (Indian violin) in “Sajani in Water,” ethnic flute in “Reminiscence,” by sustained trumpet tonality (“The Kammadan”), and sung with lyrics in “The Prayer.” It’s a haunting motif, a mixture of an emotive wail of anguish and a defiant cry for freedom. The music carries an eloquent evocation of muted beauty – a veiled splendor held captive beneath cultural discrimination that subtle underlines the film’s historically pertinent themes. “Sajani’s Struggle,” with its plaintive, throated flute melody sounding over jangling sitar and a low bed of strings, is a striking introspective ambiance; a gentle piano melody adds a reflective poignancy to the second third of the cue. The piano melody is enlivened in “Carry and Standoff,” where it opens into a spry motif in fast motion before being taken over by a percussive chase motif; all manner of light percussion, driven by droning horn and flute intonations, propel the music onward, slowing into an articulate moody texture of low winds and tablas. Kilian’s “End Credits” reprises the wailing main theme for both choir and solo vocalist in modestly triumphant fashion over a compelling circulation of flutes, tablas, tambourines, sarangi, bells, and various tonalities. A fine score with a very persuasive sound texture, luxuriant in feeling and exotic impressionism. Silva Screen’s latest compilation is devoted to Music from the Films of Tim Burton, and it’s a quite nice and fairly faithful adaptation of the music from a dozen of the director’s films (Big Fish, Planet of the Apes, and his first short films are not included). This is essentially a Danny Elfman album, as all but two of the films (4 tracks from Sweeney Todd by Stephen Sondheim, and a track from Ed Wood by Howard Shore) are by Burton’s mainstay maestro – the first two Batman films, Pee Wee’s Big Adventure, Beetlejuice, Sleepy Hollow, Nightmare Before Christmas, the Corpse Bride, Mars Attacks!, Edward Scissorhands, and Charlie and the Chocolate Factory. All are represented by a single track (although the first Batman’s is a 12:38 suite), except Sweeney Todd which has two cues included. The recording features the usual fine performances of the City of Prague Philharmonic Orchestra and Choir conducted by Nic Raine and James Fitzpatrick, and it makes for a fine collection of Burton-centric film music, even though essentially all of it is available in original form on the original soundtrack releases. The new recordings may not sparkle as intensively as the Elfman originals (comparing the “Finale” from Charlie and the Chocolate Factory, the new recording is adequate although the original sounds slightly more effervescent to me). But as a listening experience having it all together on a single disc is very nice; also the opportunity to hear the cues sans vocals on the musicals, Sweeney Todd, Nightmare Before Christmas, and The Corpse Bride, and the Main Title from Ed Wood without the voiceover narration, is a great bonus. From the Brit papers: Pop singer Leona Lewis has reportedly triumphed over Amy Winehouse in their drawn-out battle to record the theme song for the forthcoming Bond movie, Quantum Of Solace. Rehab hitmaker Winehouse was rumored to have been dropped as the film's official musical muse after DJ Mark Ronson told reporters last month he had scrapped his 007 collaboration with the singer, because she was not "ready" to work on music after a recent return to her erratic ways. Days later, Winehouse confirmed that she had, in fact, completed the song - but her spokesperson has since admitted the use of her track in the latest superspy offering is "unlikely." Now industry insiders claim Lewis, the 2006 winner of U.K. TV talent competition The X Factor, has become the favorite to record the title track. A source tells British newspaper The Sun, "It looks like Leona has finally won the race. She is seen as one of the few candidates who has the right profile both sides of the pond to do it. Amy was their original choice but she just can't get her act together and hasn't got the right image." I so weep. The Midnight Meat Train, Clive Barker’s latest cerebral-munching horror offering, which gets a big-budget release from Lionsgate on August 1st, features a score from Johannes Kobilke and Robb Williamson (Pathology). Canadian-born composer Andrew Lockington has scored Journey to the Center of the Earth, New Line’s lavish remake of the Jules Verne novel by way of the 1959 film, which opens on July 11th. Because the film was shot and is being released entirely in 3D, Lockington integrated a large traditional orchestra and full choir with the orchestral percussion of the Japanese drumming ensemble Nagata Shachu. Nagata Shachu uses gongs, bells, wooden clappers, shakers and bamboo flutes – resulting in thunderous drumbeats with subtle, intricate rhythms. As a protégé of award-winning composer Mychael Danna, Lockington’s credits include Skinwalkers (see review in my August 14th column), Saint Ralph, Touch of Pink, and the scores for the HBO features Xchange and Stranger Inside. Recently, Lockington scored How She Move and the upcoming Indie feature One Week. Look for the Journey soundtrack from New Line Records on July 8th. Varese Sarabande will release John Powell’s music for Hancock, the new Will Smith action-comedy about a seedy super-hero with an attitude (trailer is now making the rounds), on July 1st, the day before the movie opens. John Debney’s score for the new Eddie Murphy comedy, Meet Dave, will be released the same day. Danny Elfman’s score for Hellboy II: The Golden Army is set for July 15th. And if you missed it last week, Varese Sarabande has announced their June cd club releases: a 4-disc collection of Elmer Bernstein’s most notable rejected/unused scores: Gangs of New York, Journey of Natty Gann, and The Scarlet Letter; Basil Poledouris’s Iron Eagle, Henry Mancini’s The Man Who Loved Women (no relation to TMWL Cat Dancing, although both did star Burt Reynolds), Franz Waxman’s sumptuous score for the 1952 drama, My Cousin Rachel, and Jonathan Sheffer’s recent score for In A Shallow Grave. The latter is already sold out at the label (check the online sources for availability and you will find it) and the others are sure to be soon also. All are limited editions of between 1500 and 3000 copies. Satan Superstar / Black Magic, featuring themes and excerpts from contemporary 1970s material, including music drawn from the worlds of film and disco. The titles both suggest a collection of horror movie music with devil-worshipping themes, but actually only the first one (a 1977 LP) collects themes such as Rosemary’s Baby, The Omen, Exorcist II, The 7th Victim, and King of Kings (huh? – oh, it’s the devil’s temptation sequence). The collection’s most notable cue is the premiere recording of Franz Waxman’s music from the 1941 (Spencer Tracy) version of Dr. Jekyll and Mr. Hyde – excerpts of which sadly have appeared nowhere else (not even, surprisingly, on Varese Sarabande’s 4-volume Legends of Hollywood collection of Waxman’s film music). The Black Magic disc (a 1976 LP) is mainly ‘70s groove tunes of somewhat dubious connection, including “Theme from Shaft,” “The Hustle,” “Our Day Will Come,” “Feelings,” and the like. I kind of think my CD player will be programmed to quit after Jekyll & Hyde. Intrada’s new releases for this week include Alan Silvestri’s Delta Force, released in its entirety for the first time. The 1986 film was a terrorist action flick from Menahem Golan, starring Chuck Norris and Lee Marvin. Silvesti performed a splendid Synclavier score, anchored with a stirring main hero theme and bolstered with a variety of colorful ethnic music and rhythmic action music. The original Enigma label LP offered 35 minutes of musical highlights (a subsequent Milan CD was even shorter), while Intrada’s CD premieres the entire score in dynamic stereo sound, supervised by composer. A limited edition of 1000 copies. Also released this week is a world premiere release of Frank DeVol’s music for the 1973 Robert Aldrich depression-era action movie, Emperor of the North, paired with DeVol’s music for 1967 Frank Tashlin comic spy movie Caprice, starring with Doris Day and Richard Harris (only 26 minutes of this score have survived storage in useable condition). A 1200-copy limited edition. 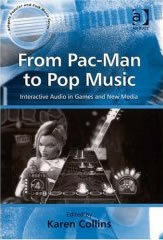 Ashgate Publishing has released From Pac-Man to Pop Music: Interactive Audio in Games and New Media as the latest entry in their laudable “Popular and Folk Music Series.” Edited by Karen Collins, the book gathers a dozen essays on the technical aspects of music and sound design for video games – with essays titled “An introduction to granular synthesis in video games” and “indeterminate adaptive digital audio for games on mobiles” you can be pretty sure you’re not going to find a lot of coverage of the dramatic use of musical scoring in video games – and in fact there isn’t a word that I could find about the actual process of composing and creating dramatic background scores for games. The book’s Part 3, entitled “Instruments and Interactions” looked like it would come closest, with three chapters, titled “Theoretical approaches to composing dynamic music for video games,” “Realizing groundbreaking adaptive music,” and Norbert Herber’s “The composition-instrument: emergence, improvisation and interaction ion games and new media” – but as you might surmise from the chapter titles, this book goes no further than examining in great detail the theory and technical aspects of game music, which is fine and its intended audience – musicologists, programmers, academics, and others more involved or interested in the technical and theoretical aspects of game music than the aesthetic of the music or sound design itself. “The selected articles presented here were chosen to present an overview of a variety of aspects of games audio that I felt might provoke some thought and stimulate discussion in an interdisciplinary fashion,” writes Collins in her preface, “and introduce the reader to this subject area from a multiplicity of perspectives.” Without meaning to denigrate the book – it accomplishes very well what Collins sets out to do (although I would question how a wide-ranging “multiplicity of perspectives” can really do the topic justice without including the perspective of at least one composer of game music – where are the perspectives of veteran game composers like Jack Wall, Inon Zur, Jesper Kyd, Michael Giacchino, and dozens of others whose dozens of game scores surely might proffer a useful inclusion in this volume and its intended coverage? ), but its audience is clearly not among those interested in learning more about the process of music as a component of games. As a scholarly and comprehensive treatise on the use, theory, practice, and technique of sound and audio (not music) in games – as well as in other breaking forms of media including web pages, theatrical events, museums and public attractions – this book is indeed fascinating and stimulating. But it remains one-sided by excluding any serious evaluation of the art and science of composing score for games and various other species of new media, which seems to me to be just as important as the theories and technical tools that join music to media. The DVD release of Sly Stallone’s latest Rambo action fest includes a featurette about Brian Tyler’s score. Criterion's newly remastered release of Alexander Korda’s 1940 fantasy The Thief Of Bagdad has an audio option for an isolated music and effects track with Miklos Rozsa's magnificently colorful score. While the track does include sound effects, there is no dialog and the music is nicely cleaned up for hiss.